Training front-line employees in an efficient, consistent manner is one of the biggest challenges facing retailers today, and the process becomes costlier and more complicated as a business grows. According to the 2017 Training Industry Report, published by Training Magazine, companies on average spent $1,075 per learner in 2017 compared with $814 per learner the previous year. They are devoting more time to training as well, with the average employee receiving 47.6 hours of training over the course of the year, nearly 4 hours more than in 2016. So with the time and money retailers devote to training on the rise, anything they can do to improve their programs and make them more efficient is likely to benefit the bottom line. Kate Spade & Co., for example, is one of the most successful and recognizable fashion brands in the world today, selling handbags, women’s clothing, jewelry and housewares. But as the company expanded from one store in 1996 (under the Liz Claiborne banner) to more than 100 in the early part of this decade, its training department faced several major challenges. With products, categories and marketplaces all expanding at the same time, it was concerned with educating its associates without inundating them with information. In addition, the company needed to ensure it stayed focused on the priorities that made it a success. Kate Spade is first and foremost a customer-centric organization, internally as well as externally. Its brand promise is to empower its customers, or “girls,” to lead a more interesting life, a message the company wants permeated externally to consumers and internally to its associates. “Everything we do is through that customer-first lens,” said Emily Sklar, Kate Spade’s senior manager, retail marketing, during a presentation at NRF 2017 Retail’s Big Show & EXPO. Training that growing team was proving to be a costly endeavor, though. Kate Spade had been disseminating training materials via PDFs emailed to store managers, who would print and post them in their back rooms. More critical product knowledge was printed at headquarters and shipped to each store. The company eventually moved to an in-store intranet, but found the technology lent itself more to the operational side of the business rather than the training and leadership on which it wanted to focus. 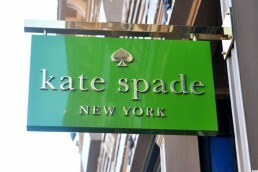 The result was that Kate Spade struggled with a lack of learning consistency and an overall understanding of how their training tools were being used. To address the issue, the company set out on a mission to revolutionize its stores and empower its associates to drive front-line performance. A key component of Kate Spade’s transformation was a partnership with New York-based technology company Multimedia Plus. Kate Spade embraced MMP’s QuizScore program to accessorize and improve existing communications programs. QuizScore is a proprietary online training platform that enables clients to reach employees in the field and drive performance. The platform bundles high-definition video and interactive training inside a lightweight app, so bandwidth is never an issue. Tracking software helps clients assess training effectiveness to determine where employees need improvement, and how best to refine programs by regional, district, and store levels. A client’s database is stored in the cloud, which enables field managers to easily access the information they need from any location with a laptop or smartphone. MMP customized QuizScore interfaces for Kate Spade, introducing the value of engaging, low bandwidth video and the ability to track performance by region, district, store and employee. Those features allowed Kate Spade to easily measure the progress of employee training throughout its entire store network. In late 2015, a second major training challenge emerged as Kate Spade rebuilt its specialty store selling strategies by focusing directly on personalizing the guest journey and delivering a best-in-class experience. Sklar and her team, which partnered with MMP to build and customize the video-based INCITE app for iPads and PCs, created an interactive, private in-store training and communications broadcast network designed for front- line engagement and field accessibility. MMP’s introduction of INCITE in 2016 pioneered a new associate enterprise application category – the Mobile Associate Communications Platform (mACP) – which advances how retailers like Kate Spade successfully are educating, informing and evaluating their most expensive asset: in-store employees. INCITE provides organizations with a low bandwidth way to deliver multimedia communications and video without streaming, while at the same time delivering real-time metrics for visibility into participation and completion by field managers. The sophisticated, highly branded platform – which Kate Spade calls its Style Study – features patented, instant- on, non-streaming video regardless of store bandwidth; a drag-and-drop self-publishing interface; granular targeting; real-time metrics; instant, internal global broadcasting from an iPad or desktop; and a simple dashboard interface. Associates engage at their own pace with the Style Study course selections they are eligible to view and monitor their own progress. Video courses include brand story; products; specialty and outlet brand experience; specialty and outlet seasonal training; visual merchandising; and loss prevention. The training team can easily add, delete and modify course materials at any time, with changes broadcast immediately and simultaneously to all associates and field management. When clicking on the Style Study’s product tab and selecting eyewear, for example, associates are introduced to a full buffet of eyeglass and sunglass attributes, including key materials, features, shapes, lens and frame colors, selling tips and care. Even construction details are illustrated (bridge, lens, arm, etc.) as well as face shapes and the best frame styles for them. Brief quizzes after each short module let associates and their field managers assess training retention. Quiz scores help identify opportunities to celebrate successes as well as areas to improve. In some cases, as the company grows, the modules themselves may need streamlining an ongoing process for any learning and development organization, and one easily managed with the INCITE technology. Instill complete confidence in associates in delivering to guests the Kate Spade brand promise:To inspire customers (Kate Spade’s “girls”) to lead a more interesting life. After embracing the INCITE solution, one particularly noteworthy outcome for Kate Spade was “a $20 jump in average dollar per transaction [ADT] in one of our Maryland stores, which is a huge, huge boost in business for just one store,” Sklar said in her NRF presentation. Another store saw a 21 percent lift in handbag sales in 1Q2016. Today, Kate Spade is a subsidiary of the New York-based fashion brand holding company Tapestry Inc. The Kate Spade division alone achieved $1.28 billion in revenue in fiscal 2018 , with 342 directly operated stores and 5,500 employees. Revenue for the brand in fiscal 1Q19 totaled $325 million, up 21 percent compared with the same period last year. Kate Spade’s management team depends on reports from MMP’s QuizScore website, the backend data analysis engine behind INCITE, for quick recaps as well as detailed, real-time results of training compliance, based on the quizzes, to determine how well the training has been understood, and its impact. Using QuizScore, management also can drill down – by region, district, store and employee – to explore and evaluate training in progress, completed and not started. Real-time, up-to-the-second completion rates are reported by percentage of training completed, with the option to view program results by store employee. Another significant INCITE feature, Sklar said in her NRF presentation, is the ability to break down the training modules into bite-sized, absorbable pieces. Video modules resident on an iPad provide instant, non- streaming presentations that further engage young associates, without the buffering that can distract from streamed content. “We know social media has all but eliminated the millennial associate’s attention span, so it’s important for us to be able to communicate information that’s clear and concise; in line with the way associates want to be communicated with today in a busy retail environment; and allows associates to learn on the fly,” Sklar said. INCITE significantly reduces payroll dollars simply by keeping associates on the sales floor longer – a tremendous operational advantage for retailers operating on razor-thin margins. In between customer time, new and established associates stay up-to-date on the latest product, branding, merchandising, workforce, corporate communications and other information – all without leaving the selling floor. For Kate Spade, the INCITE platform also has eliminated the time and expense of holding two-hour training sessions every month. “Payroll is always a concern in retail, so being able to learn in the moment during a slow period on the sales floor, using the iPad, has been huge for us,” Sklar said. Digital multimedia content also eliminates the need for and expense of inconsistent “Train the Trainer” programs, as well as costs associated with printing and shipping training manuals and their continual updates. Adjunct video-based digital training – a loss prevention awareness module, for example –benefits a retailer’s bottom line as well and protects loyal customers from otherwise avoidable cost increases. Kate Spade’s app-based video communications and training have escalated key performance indicators across the store operations spectrum, Sklar said, wholly justifying the ROI of customized training software as well as the cost of the tablets themselves. Fashion retailer Kate Spade & Co. has seen massive growth over the course of its 22-year history, but it wasn’t all smooth sailing. One of the issues the company faced as a result of that growth was finding ways to educate and train associates across an ever-increasing number of locations in a consistent, efficient manner. Thanks to a partnership with Multimedia Plus, Kate Spade was able to standardize its training programs with non-streaming video courses, tracking employee progress and empowering associates to deliver a consistent brand message. Download this free case study to see the results the company has been able to achieve with MMP’s INCITE platform. not ready to commit? click here to browse our site.